The California-based company called Dank Woods is rumored to have invented these carts in 2018. They claim to offer a line of THC oil cartridges known as Dank Vapes Cartridges. They sell THC Oil cartridges with a variety of unusual flavors like Fruity Pebbles and Lemon Slushy. Unfortunately, Dank Vapes, as well as other cartridge companies, have come under scrutiny in recent times. Many Dank Vapes reviews claim they received an unpleasant experience from their Dank Vapes cartridges. From headaches to issues with potency, it’s evident that not all Dank Vapes cartridges are equal. There’s an increasing demand from people who don’t live in states where cannabis is legal. 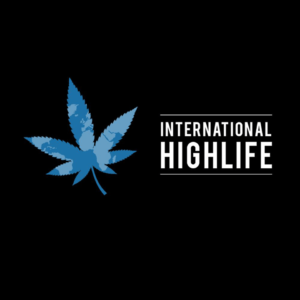 This situation is affecting everyone in the cannabis market. Many questions surround the authenticity of these carts. You’ll find comments and questions in various online forums and on social media. Who is Dank Woods? Is my Dank Vapes cart real and how do can I check that? 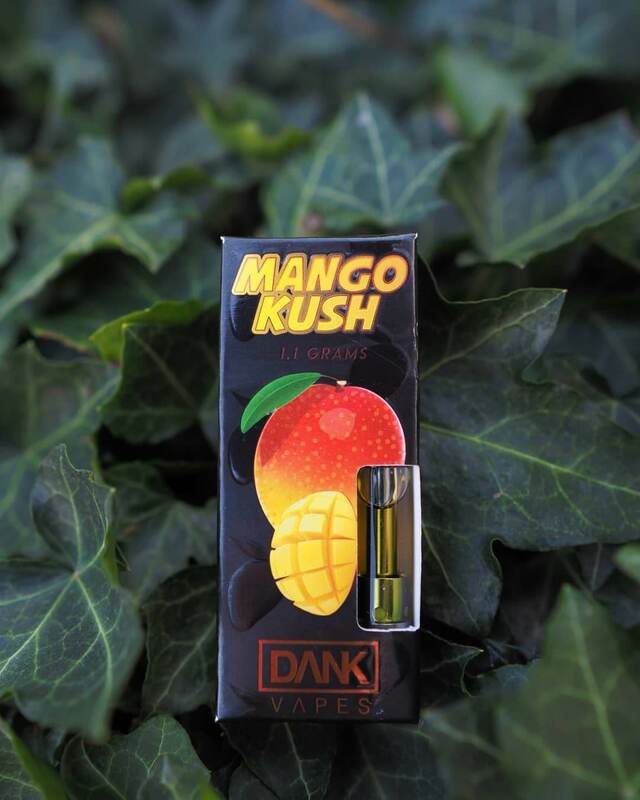 In this article, we will explain everything you need to know about the Dank Vapes cartridges. These things are everywhere, and the information available about this brand and its product is minimal. Websites like DHGate, Alibaba and even Amazon.com have dank vapes packaging for sale. These websites allow the sales of Dank Vape cartridges, while it’s unclear whether they’re real in the first place. Anybody could go online and purchase these carts and their packaging, then fill them with whatever they’d like. You won’t be able to find Dank Vapes carts in a licensed dispensary because they’re only available on the black market. If a dispensary carries this brand, you can be sure that the dispensary is illegal. Dealers purchase these products in bulk and then fill them with a variety of potentially dangerous things. If you’re lucky, they’ve filled it with actual THC oil. If you’re unlucky, you face anything from bunk oil to oil laced with nicotine. 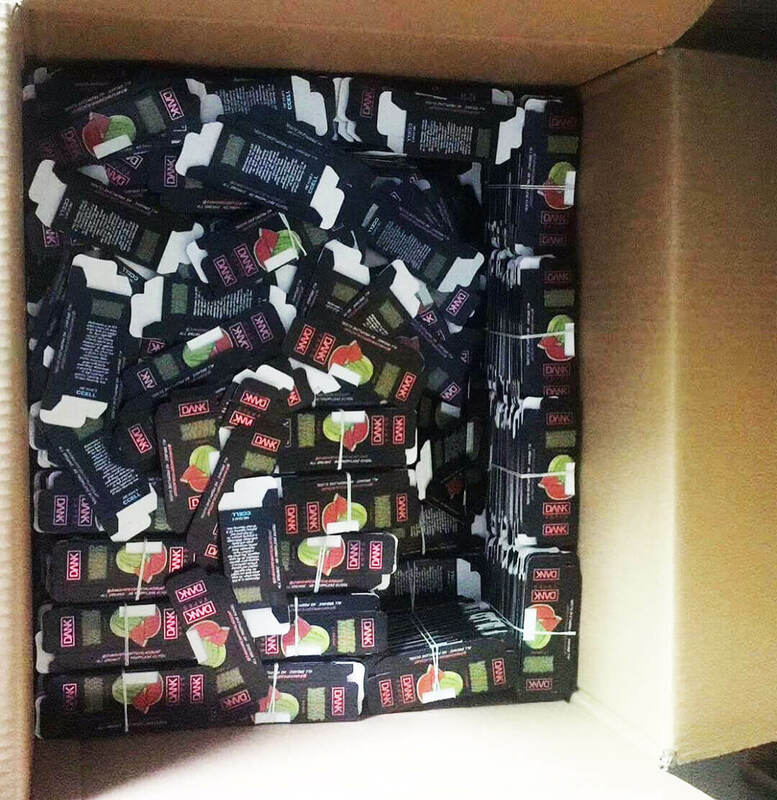 They then package the counterfeit hash oil cartridges in branded packaging and resell them with excellent margins. It’s similar to buying a fake Rolex, except your ego isn’t the only thing at risk with counterfeit carts. 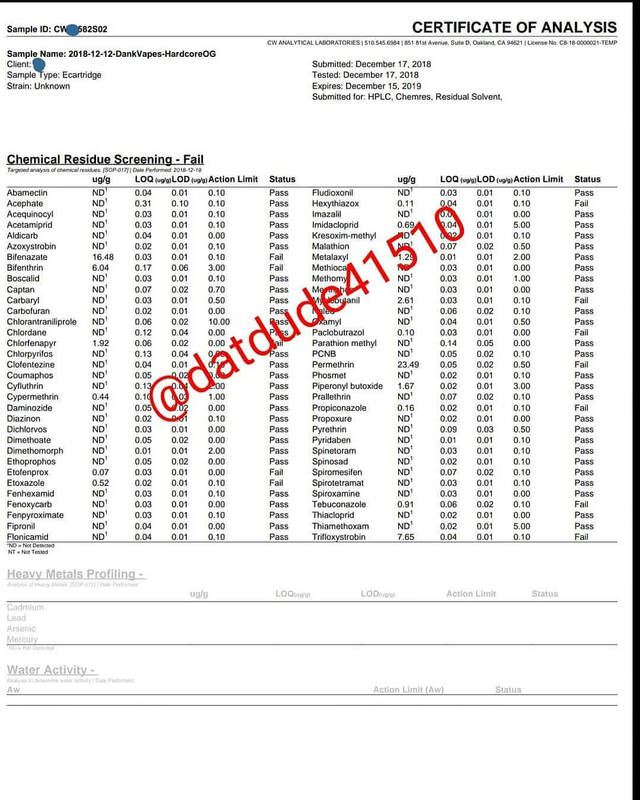 Proof there is pesticides inside of Dank vapes cartridges. Many of these fake carts contain pesticides because a street dealer is not going to spend money to test the products they sell adequately. Some carts have been reported to contain synthetic oils like K2 in them. The government knows K2 as a new psychoactive substance(NPS), but to everyone else, it’s synthetic cannabis. K2 interacts with the same parts of your endocannabinoid system that cannabis does. Side effects of K2 can include confusion, hallucinations, extreme paranoia, anxiety, vomiting, and violent behaviors. It’s not very common that prefilled vape cartridges on the black market contain K2. Pesticides and other impurities are an issue that’s way more widespread. Buying from the black market isn’t safe, because most street dealers only care about profit. It’s important to understand that the dealers are taking advantage of your finances and they also put your health at risk when they sell you dirty cartridges. Typically, cannabis oil without any pesticides isn’t cheap and cost $65 for a gram (before tax). What Makes a Dank Vapes Cartridge Fake? Fake Dank Vapes look precisely like the real thing! The answer to that question is one that everybody seems to know for a fact. The only problem is…nobody really knows for a fact. A simple search online of “fake dank vapes” will yield results from all over the Internet. You’ll find YouTube reviews of Dank Vapes carts, forums of people claiming they got a “real” cart, and everything in-between. The one thing you won’t find is proof that real Dank Vapes carts exist. Dank Woods website is one blank page with a link to their on Instagram. 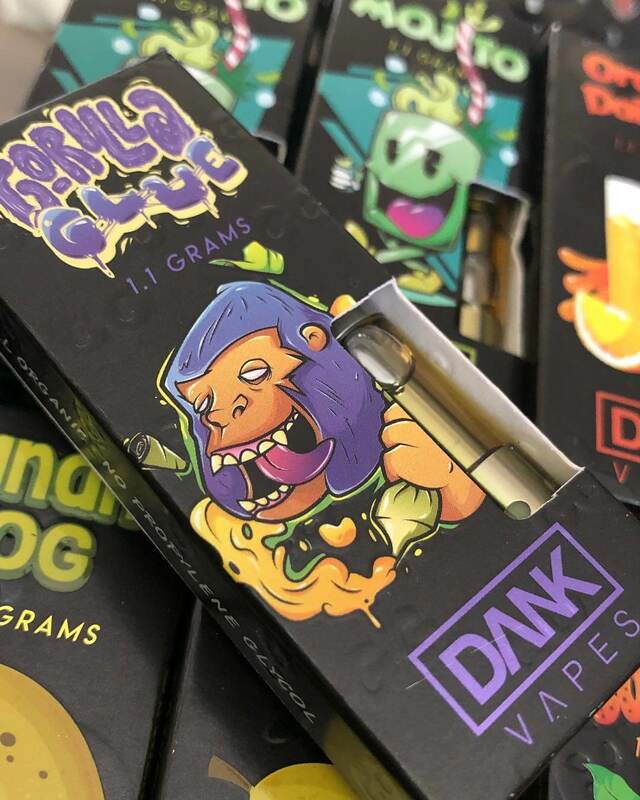 On their Instagram @dankwoods, there is no mention of Dank Vapes carts from the company, whatsoever. Online you’ll find many common tactics being passed around to tell the difference between real and fake Dank Vapes. The most common tactic has to do with the actual box these carts come in. On the side of each Dank Vapes box is a handle linking you back to social media. Many users claim that the handle @DANKVAPESOFFICIALACCOUNT is the real Dank Vapes. Other handles like @DANKVAPESOFFICIAL are thought to be fake. However, both boxes are sold online for bulk purchases. The Instagram linked to @DANKVAPESOFFICIALACCOUNT is set to private and contains a link to a “back-up” Instagram. Neither profile contains any contact information, nor any valuable information about Dank Vapes cartridges. This is a serious red flag. 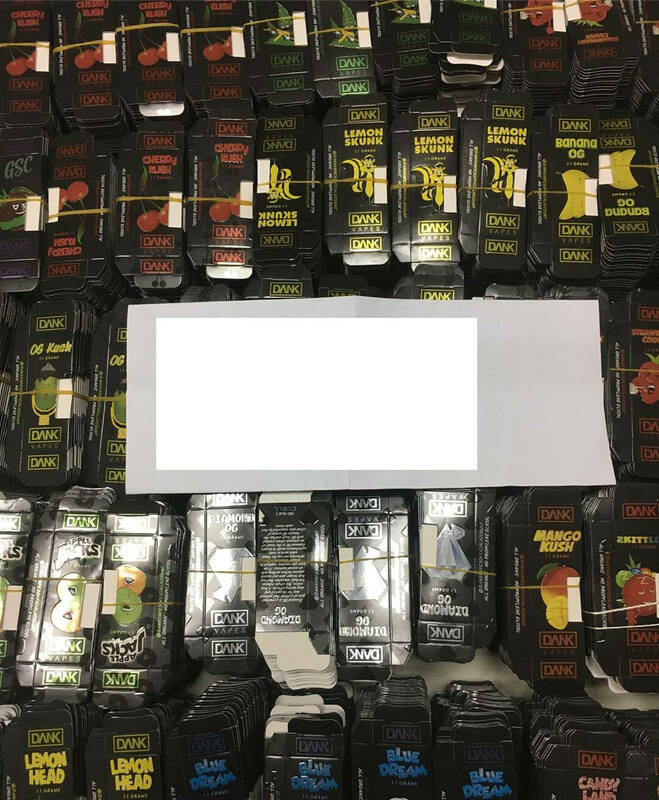 Fake Dank Vapes packaging sold online from China. Another common tactic online claims that Dank Vapes changed their packaging. The old packaging is light in color while the new packaging is black. Unfortunately, online companies have managed to get their hands on this new black packaging. People are claiming that Dank Vapes no longer uses the former packaging, and that’s how you’ll know for sure. If you don’t, I’ll break it down for you. All Dank Vapes packaging is sold in bulk together with empty cartridges. That means that whether or not the packaging is old doesn’t matter. Whether or not the packaging contains the “real” Instagram handle, doesn’t matter either. They are all sold online and filled with homemade oils. No one tests the product in a lab for pesticides or any other impurities and last but not least, no legitimate dispensary is carrying Dank Vapes. Next, we have the cartridge itself. People online have many views about what makes a Dank Vapes cart authentic. You can go to YouTube and find videos discussing what makes a Dank Vapes cart fake. You can then go to another video explaining real Dank Vapes and see the same cartridge. The information being passed around about spotting the difference between fake and real Dank cartridges is not reliable. You may hear real Dank Vapes have a serial number starting with CA followed by three digits (CA123). Nobody knows if their Dank Vapes cartridge is real. 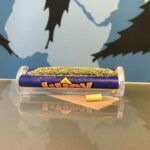 Everything about Dank Vapes cartridge is word of mouth, and you won’t find a legitimate source to confirm these claims. Reports say that any cartridge not filled by Dank Vapes is a fake. If that’s the case, then all Dank Vapes cartridges are fake. You may find that the oil in your cart is thin and moves around easily inside the tank. This means there is a good chance the oil is of shallow quality. Often, the thin oil is the result of cutting or mixing in other products with the oil. This may be something like propylene glycol, found in e-liquids. Going back to a point we made earlier; your cartridge could contain a substitution like K2 or nicotine. Both of these substitutions are addictive and harmful to your health. Dealers often lace their oil with these chemicals for a couple of reasons. The first reason would be to make more profit. The less THC oil that’s actually in the cartridge, the more money the dealer makes. 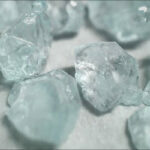 It’s a similar technique dealer use to mix cocaine or heroin with other substances. They get the product in pure form and add other cheap materials to maximize profit. Then they will sell it in smaller quantities to make even more money. There is too much money to made in the cannabis industry right now. The vape cartridge industry is new and barely experiencing counterfeit problems for the first time. The price right now for legal oil cartridges is more money than the fakes because of the high taxes on it. So much in fact that California is considering to lower the current cannabis tax to counter the cheats. The purpose of reducing the tax is to make buying cannabis legally more attractive. This will drive more sales and thus increase tax revenue generated from the sales. Unfortunately for the addicted, this means trusting their dealer and risking their lives. You can say the same can about counterfeit cartridges like Dank Vapes. Dealers may put synthetic substances Vapes. K2 liquid into their carts to simulate THC. Many users claim that their Dank Vapes oil tasted nothing like cannabis Vapes or gave them a headache. This may deter them from purchasing again, but people who don’t know the difference may pay the price. Dank Vapes laced with K2 or nicotine Vapes these same addictive qualities, and keep customers coming back. While nicotine itself is not a huge concern, substitutes like K2 are hazardous. Becoming addicted keeps you on the hook and keeps your dealer’s pockets fat. This is why it’s so important to only buy cartridges from licensed dispensaries that go through lab testing. Important testing is also essential to ensure your oil isVapesfree from pesticides and Vapes harmful chemicals. Long term effects of pesticide ingestion can cause serious health issues and even death. Why Do People Buy Dank Vapes Cartridges? So after all of this information is presented and easily accessible on your own, you ask the obvious question next. Why would anyone buy a Dank Vapes cartridge? It has a couple of reasons why people put their trust in Dank Vapes. First of all, Dank Vapes targets younger people who don’t have easy access to a dispensary. Perhaps they live too far from a dispensary or cannabis products are illegal in their state. 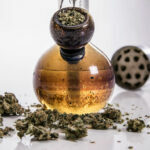 The legal age to purchase or use cannabis products recreationally is 21 and older. We think that Dank Vapes carts are an attractive option for anyone under 21. This goes back to the point that Dank Vapes packaging targets the younger generation. If your dealer is selling you these cartridges, they probably don’t even know what’s inside the cartridges themselves. Up the chain of command, a Dank Vapes cart could be pre-filled before it’s passed down to the street level. When it’s all said and done, you have to go to them for business, and that’s why they sell these carts. If you could go to a dispensary, you would go to a dispensary. When you go online to research Dank Vapes cartridges and find a minimal amount of information, then you’re stuck. Do you decline a gram of 91% Lemon Slushie oil if your dealer vouches for the product? Most likely, you’re going to take their word for it as you usually would and hope for the best. This is not to say that your dealer is intentionally trying to harm you, or that the oil is bunk, but it means that you have to trust who you’re buying from. Your dealer may be filling their Dank Vapes cartridges with clean, high-quality oil or his supplier does so. These are both possible scenarios. It would explain why some consumers swear their Vapes cart is real while others couldn’t disagree more. For all of the Dank Vapes filled and sold with quality oil, many others are not. We understand that the truth about Dank Vapes is hard to accept for a lot of people who bought their products. They want to believe they have a “real” Dank Vapes cartridge, and they want you to believe it too. That’s the evil genius behind Dank Vapes. 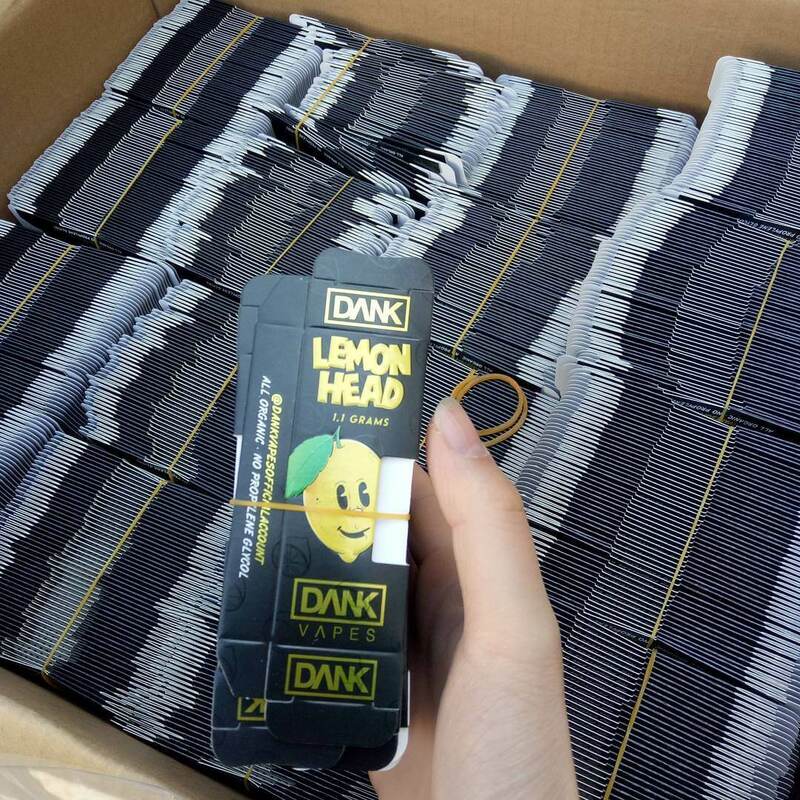 Dank Vapes knows their packaging is going to be sold exclusively on the black market. 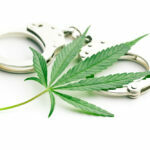 They hold no liability for adverse effects or negligence because they don’t sell THC oil. It’s not illegal to sell packaging or Ccell cartridges in bulk on the internet. They’ve created a following and hype online to appear authentic. They provide little to no information about their product, and no dispensaries carry them. They don’t need to go through lab testing or any legalized cannabis legislature to sell their Dank Vapes packaging. Dank Vapes knows that the reviews are going to be inconsistent. It’s odd how fast the new packaging for Dank Vapes appear for sale after the initial release. When it comes to reviews, some people say it’s bunk; some people say it’s the best cartridge they’ve ever used. It’s a dangerous cycle that is harming cannabis culture and harming people who come across the wrong cartridge. The best advice we can give you about Dank Vapes cartridges is not to buy them. If you don’t purchase Dank Vapes cartridges, then you never have to worry “Is my cartridge fake?”. Purchase all of your pre-filled THC oil cartridges from licensed dispensaries or fill carts with your THC oil. Don’t fall into the Dank Vapes cartridge trap, and trust your gut when something sounds too good to be true.